Greek Tsikoudia – An integral part of the Greek culture and way of life. First things first! What is Tsikoudia? 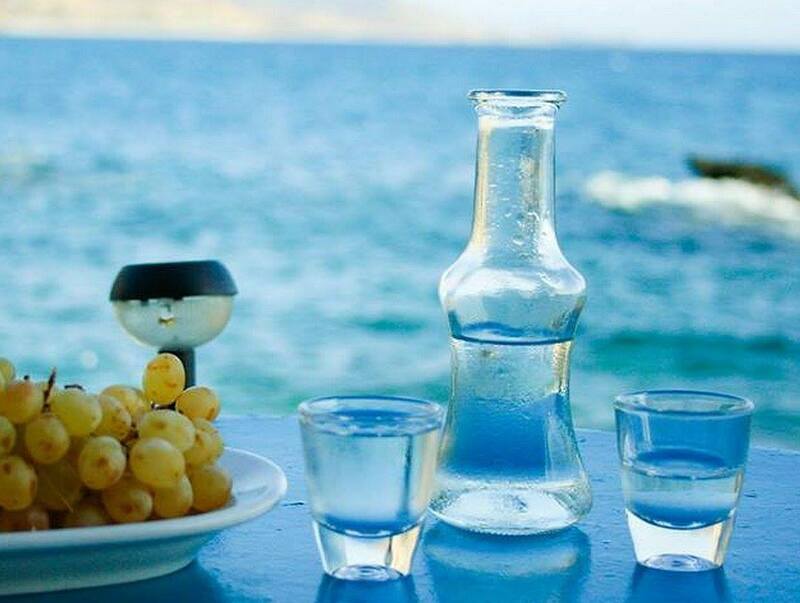 Tsikoudia also commonly know as raki is a strong grape-based alcoholic beverage famous all around Greece. It is clear as water, containing 40-60% alcohol by volume. It is made by distillation of pomace and pieces of grapes (stems and seeds) that remained after a winemaking process. Nothing goes to waste in Greek tradition! And why you should taste it? First of all, because it is a Greek drink that you will meet literally everywhere in Greece. From the Cyclades to Crete and from Pindos Mountains to Athens Greeks always ordering tsikoudia to taverns or bars. Secondly, because tsikoudia is an integral part of the Greek traditional cuisine for ages. According to predominant rumors, its history begins eight centuries ago inside a stone monastery on Mount Athos. Several monks tried to keep themselves warm in the cold winter by exploiting nature to the fullest. History of wine is pretty much the same. Humans trying to exploit vine to the maximum. Apart from the fruit, producers used also leaves, shoots, and its trunk. As a result of this exploitation, there is a huge variety of flavors, colors, and qualities. After the completion of wine production in Greece, it’s time for Tsikoudia production. Main ingredients are the remnants of the process of turning grape into wine. Those remnants are called “Chikudas”. Producers keep Chikudas in a sunless and dry corner of their warehouse for 30 days of maturing. Then, they are ready to provide us with their precious ingredients once again through the distillation process. This recipe left monks and spread throughout the Mediterranean meeting several changes and counterfeits. Therefore, within few years Tsikoudia was famous not only in Cyclades and Crete but also in Italy, Cyprus, the Middle East, Turkey and other places. All three products are an extra income for breadwinner farmers since 1900. In Greece, there is a tendency to celebrate whatever makes you happy. This is why there is a festive period dedicated to the production of Greek Tsikoudia. During the last days of fall, people all around the Cyclades come together in “Kazania” or “Kazanies”. Large groups of family and friends gather in the warehouse of the distiller to eyewitness the first production of the year. All together they eat and dance, and welcome the new tsikoudia on production. Believe me, drinking Tsikoudia in Greece is more than drinking an alcoholic beverage. Do not miss this chance! Join hopwave and find your next islands destination for the best Greek traditional drink!